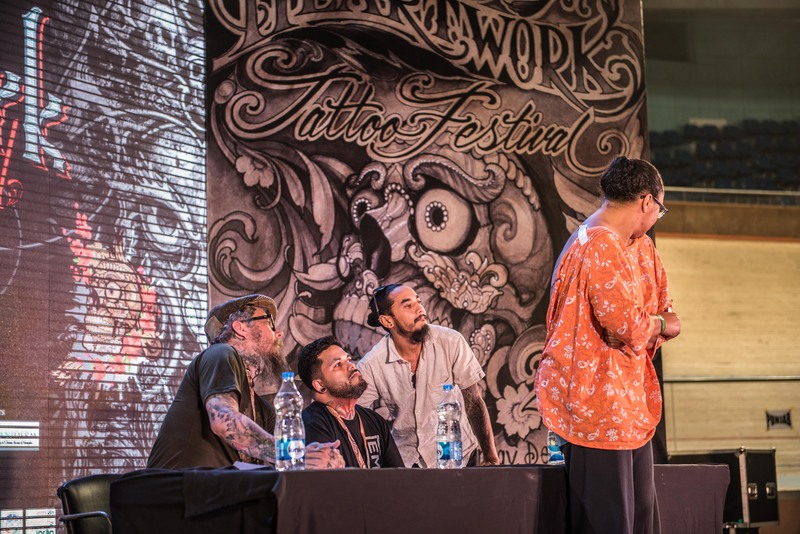 Heartwork Tattoo Festival 3.0 promised to be the biggest gathering of world-class tattooing talent in this part of the world, till date, and it delivered. 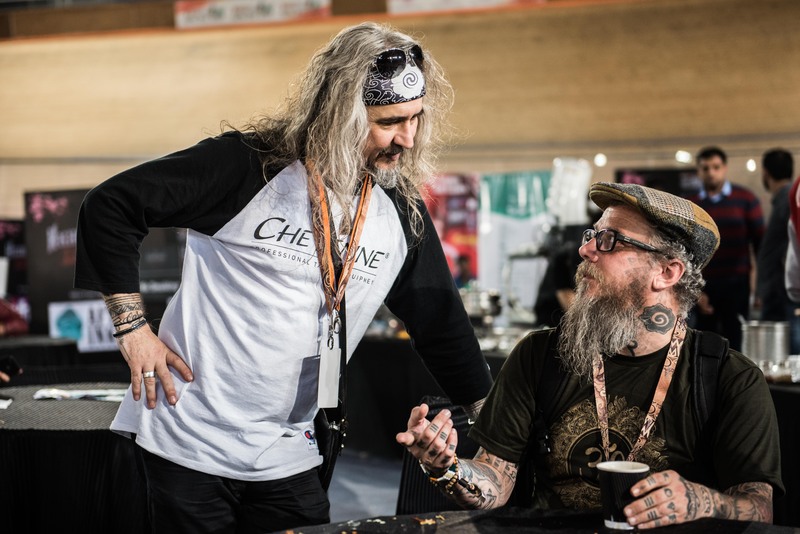 For a week, I was surrounded by the finest bunch of tattooing craftsmen I have ever come across. Art of all forms, shapes and dimensions was flowing all around me, and in the midst of it all, I had the task of soaking it all in. Wow, what a task! 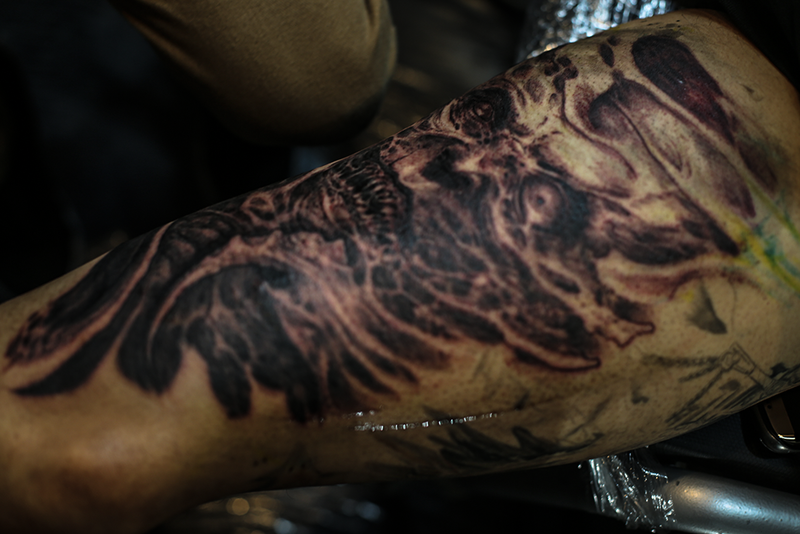 Delhi’s air pollution levels were very poor, as the electronic boards outside the airport announced, but all I had to do to ensure a mind-widening weekend was first buy a clinical mask from a medical store, score some of the finest cream I have ever tasted, and reach my first pit stop: Devil’z Tattooz in GK I. The moment I stepped foot in Devil’z, I could see part of my tattoo family already stationed there, and having a gala time. 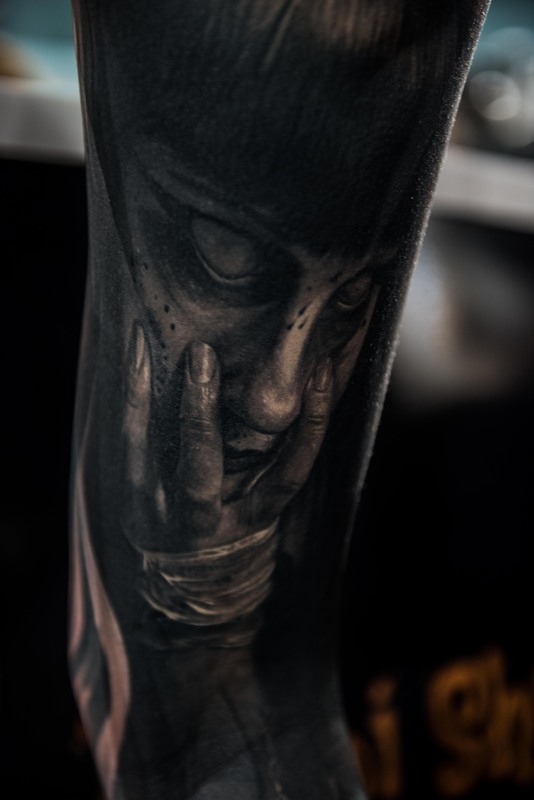 While some shared stories and uploaded few more on Instagram, others were mostly engrossed by what was happening in the primary tattooing chamber of the studio. 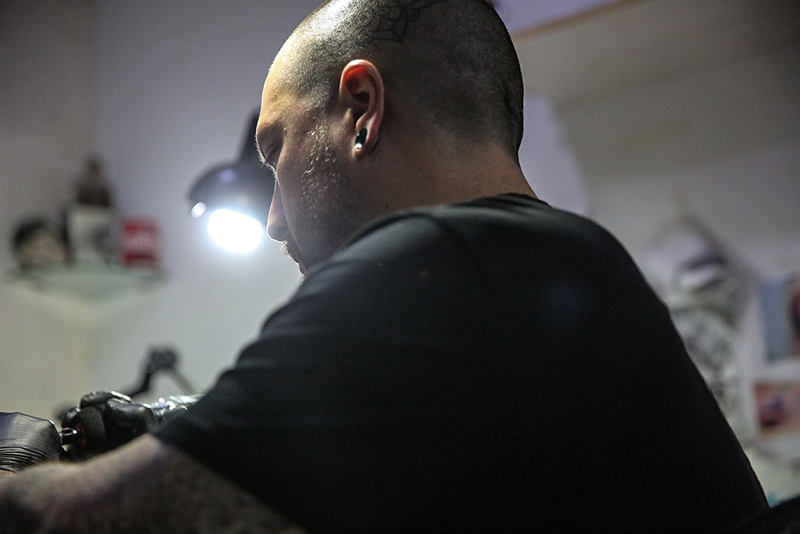 The inimitable Jeff Gogue was in action, tattooing one of India’s top artists and a very good friend, Alex Shimray. Aaaand, it was a sight to behold. While the rest of the studio already started the party, this man was unfazed by everything that was happening around him. No problem at all. I stood about 5 metres away from him, slightly stoned, and just watching his eyes. They told a million stories with every blink. UNREAL. What a beginning to the most-awaited convention in the calendar! 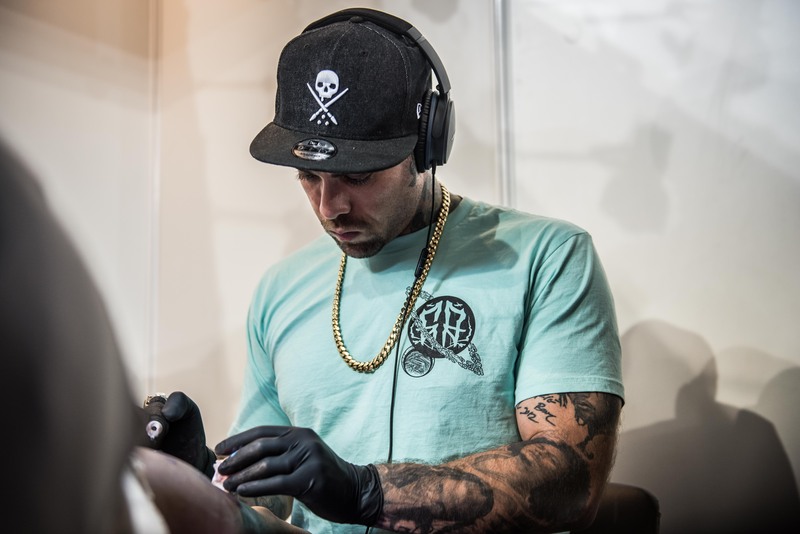 Jeff Gogue tattooing at Devil’z Tattooz. Stepan Negur with a few fans. 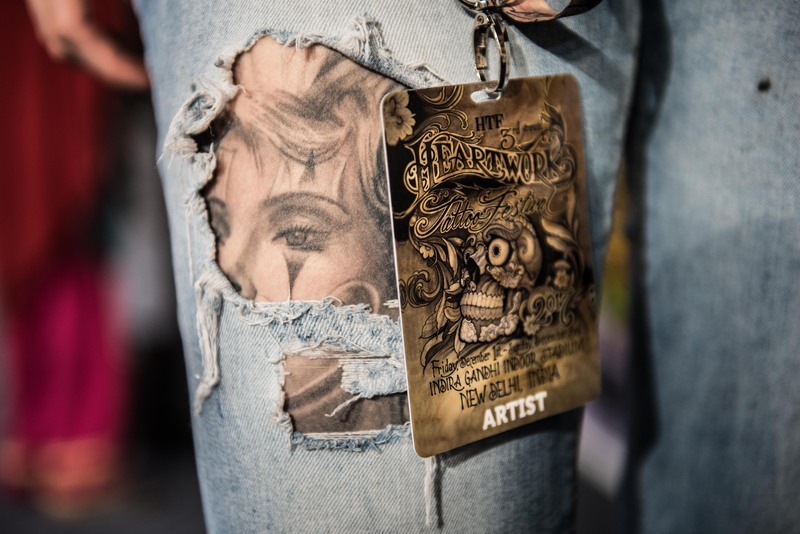 Heartwork is known to attract intelligent artists and crowds alike. 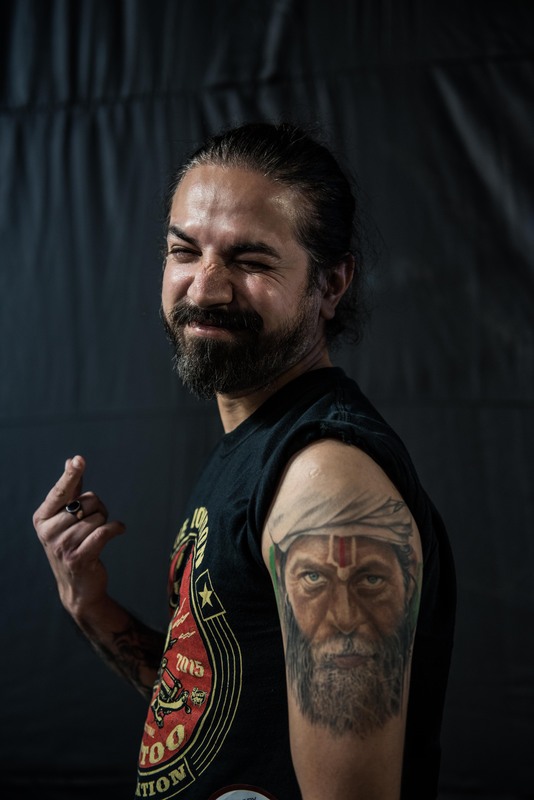 Some of India’s most serious tattoo collectors always make it a point to get inked at HTF, and this year was no different. 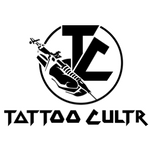 We saw quite a few full back tattoos, full sleeves, half leg sleeves and much more. 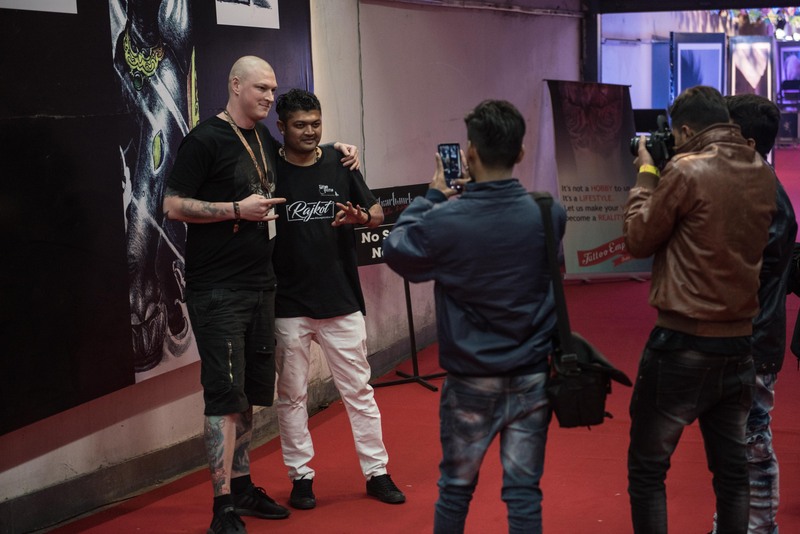 The likes of Stepan Negur and Derek Dereksan were in extra demand, as their black and grey bio-organica has found some serious takers in India. Similar was the scenario with the realism genius of Randy Engelhard and Steve Butcher as well. Derek Dereksan (left) and Robin Kodial (right) tattooing Pinku Bijoy Ghosh. Randy is seriously fast. 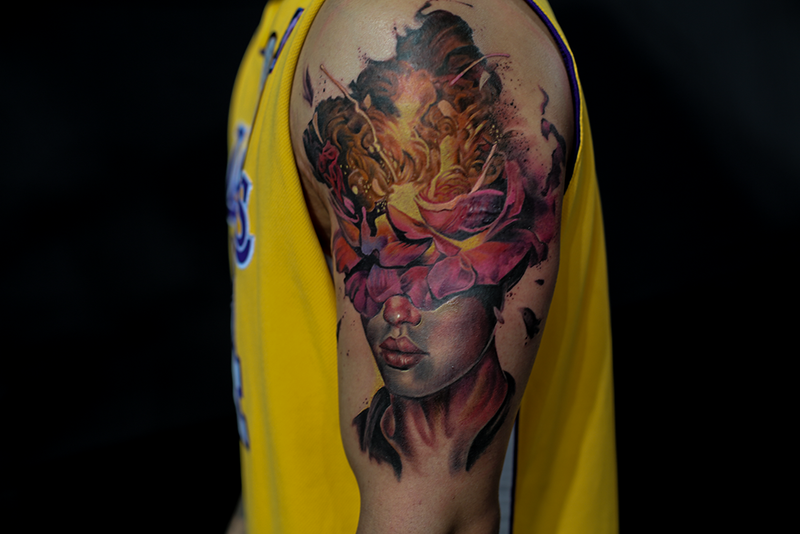 He finished a realistic black and grey half sleeve tattoo in about 4.5-5 hours flat. And, Steve is unbelievably precise. 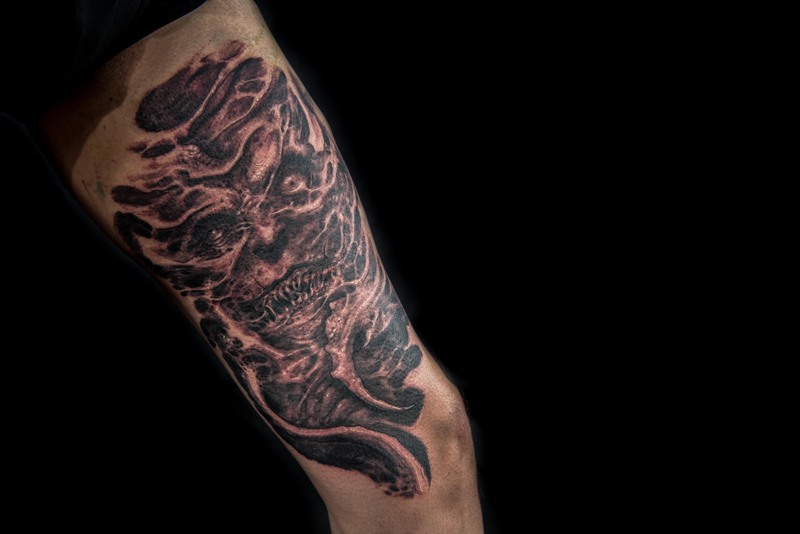 When it comes to rendering an image on skin, there might be very very few better than Steve Butcher. 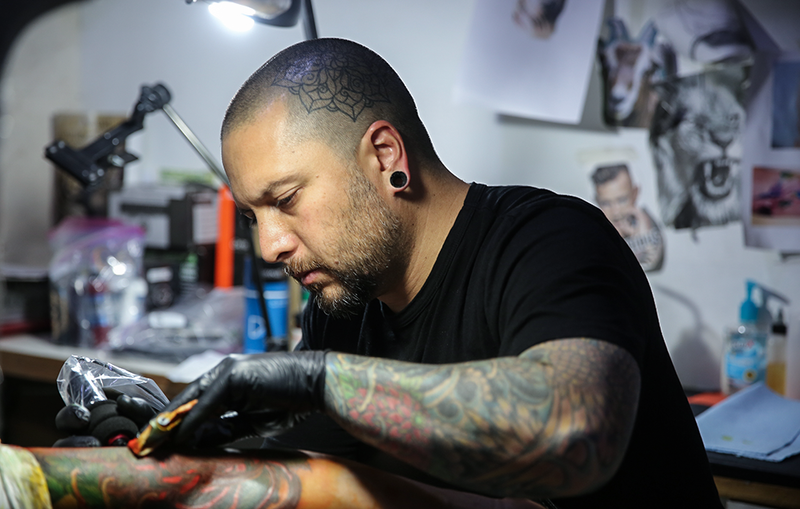 For realism collectors, they also had the glorious opportunity of witnessing David Vega at work. That guy is some another level of smoothness. 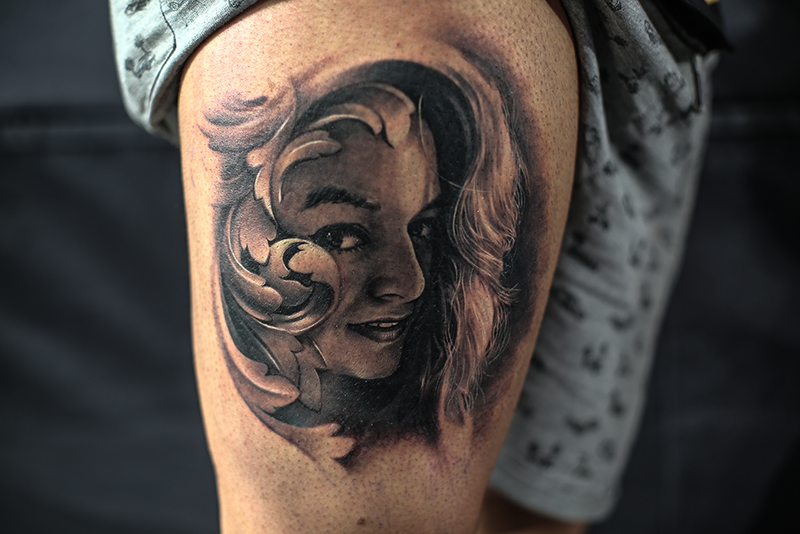 Known for his portraits, I saw him doing one, and you have to see it to believe it. And it wasn’t just the visiting American or European artists who were amazing us with their work. 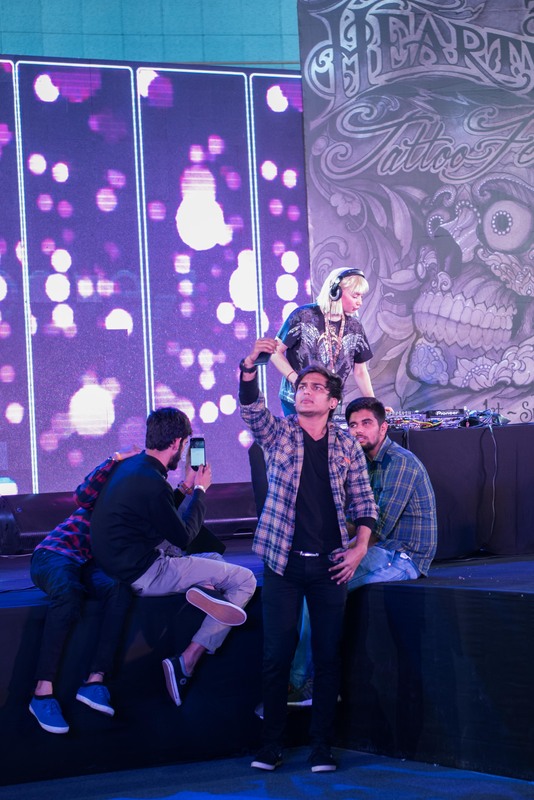 The Indian artists were the real show stealers. 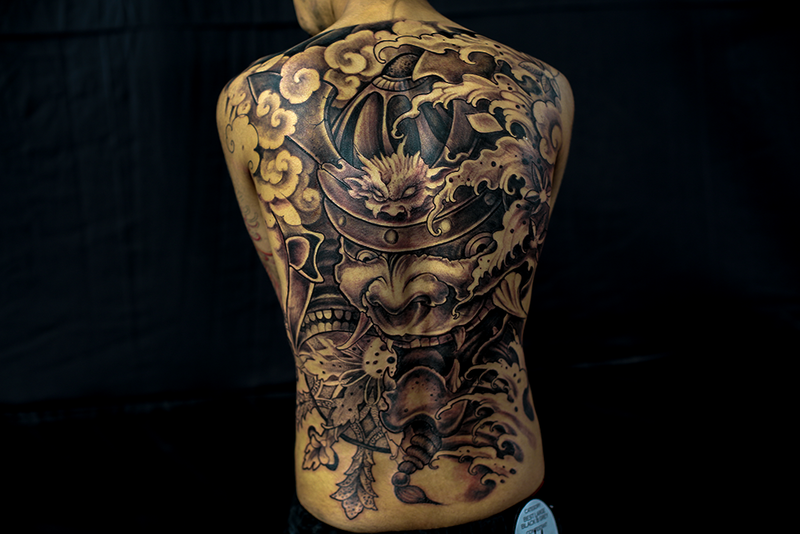 Kolkata’s Palzor Lepcha was probably a personal favourite with his collaboration (with Kabir Ray) back piece. It was simple, contrasting, vivid and legible from 30 feet away. 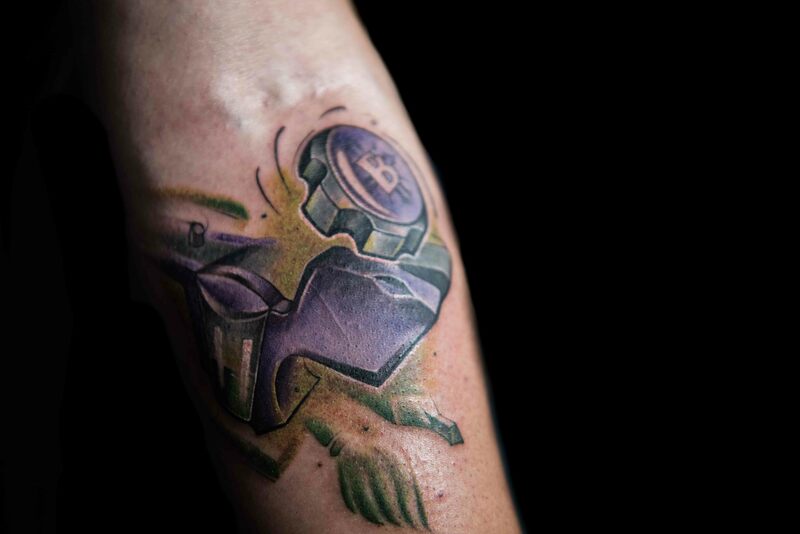 All in all, what a solid tattoo. 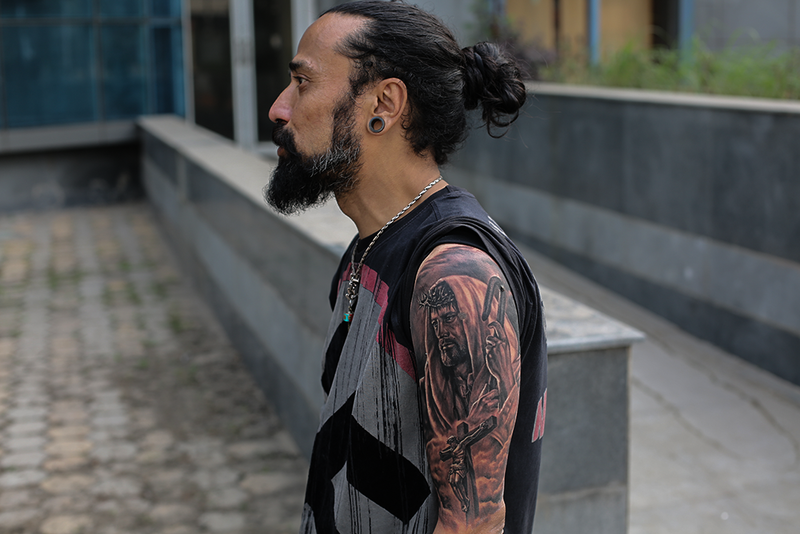 Collaboration tattoo by Palzor Lepcha and Kabir Ray of Rites of Passage, Kolkata. 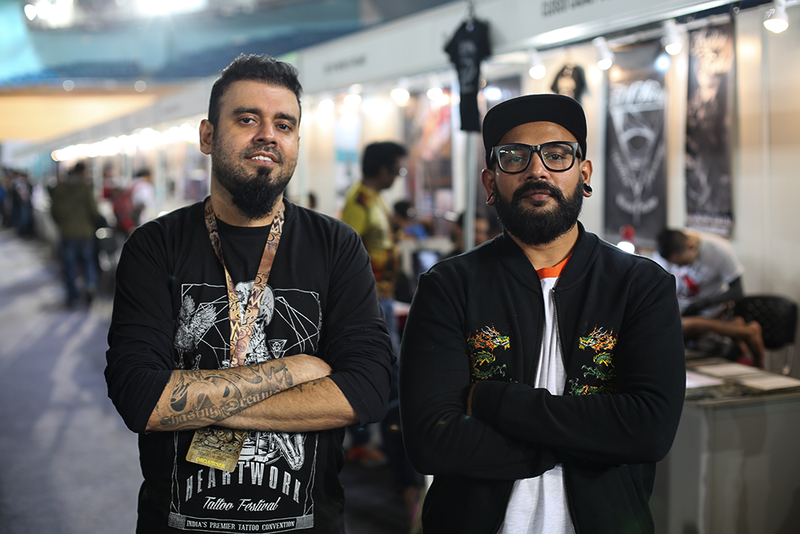 Mumbai’s Aliens Tattoo bagged seven awards for their realism pieces. 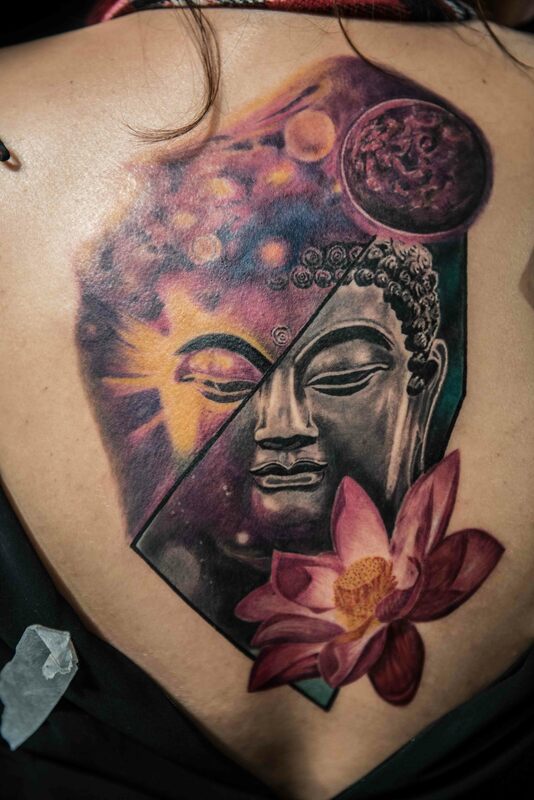 Iron Buzz Tattoos’ Eric Jason Dsouza was outstanding with one of his signature surreal compositions, and Binay Gurung from Nepal left us in awe once again. 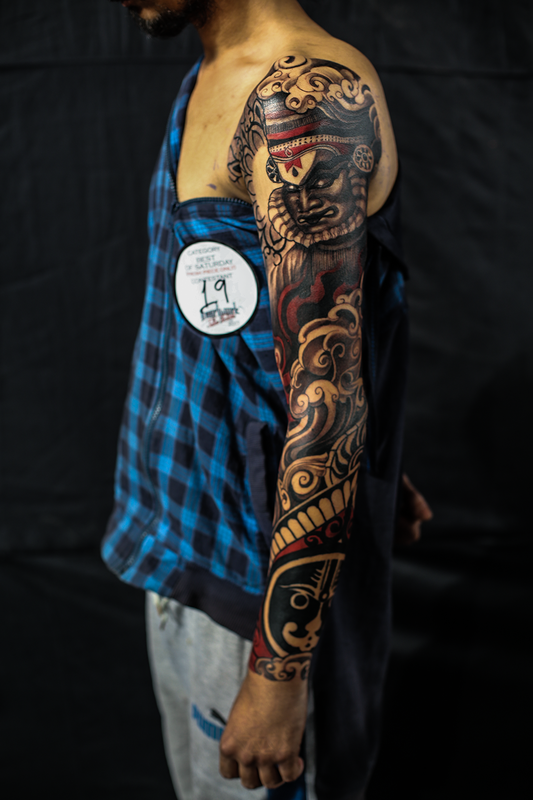 He finished a full sleeve from scratch, using traditional and modern elements, in two days, and even managed to chill with us on the third day. 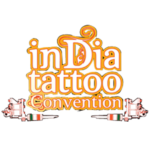 It was actually a relief to see that tattooing was the primary attraction at a tattoo convention. 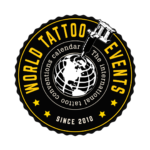 Of late, with the idea of tattoo festivals taking over, we are at times left searching for technically good tattoo conventions. This was the perfect example. A breezy crowd. 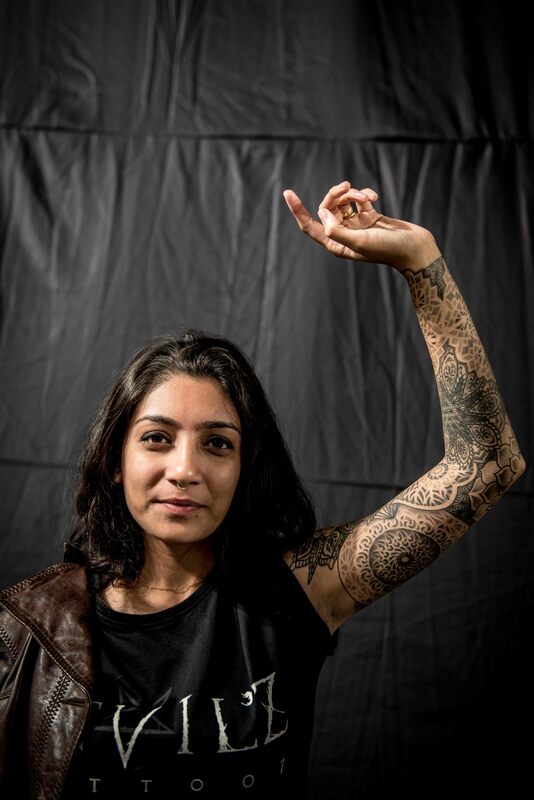 Lots of good tattoos. And a chilled out atmosphere. Add the Delhi winter to that, and we were close to being PERFECT.